mysophobia /my·so·pho·bia/ (-fo´be-ah) irrational fear of dirt and contamination. If you are a self-proclaimed germophobe, you are actually evidencing some degree of mysophobia, the irrational fear (and thus general hatred) of dirt, germs and ick! contamination. We all know a germophobe or two. They’re everywhere, really. The woman who sits in the front row at church and waves her hand to swat germs away from her face when coughing kids come up for the children’s lesson. The fellow who grasps the handle to the public washroom with the tail of his shirt rather than touching the greasy metal. Bringing wipes to clean off the surface of the ATM. Germophobia comes in many forms. Perhaps you’re a germophobe yourself, who just doesn’t like the look or feel of unclean places. Relax, you’re not alone. Such fastidiousness may not be necessary to avoid germs, but many people feel less anxious when their fears are assuaged. You don’t need to feel you’re powerless against germs. There are plenty of healthy, normal ways to fight germs in your home and in the great big world without feeling obvious or guilty about trying to kill germs or anything else in the world that makes your skin crawl just thinking about it. If you like the idea of zapping germs in the air you breathe with 99.97% efficiency, you can use UV Sanitizers in your home and when you travel. These miraculous devices use specific wavelength light to eradicate airborne germs including bacteria, influenza-A, staphylococcus, flu virus, HSN1 and more. If that sounds good to you, try the Germ Guardian UV-C Air Sanitizer, proven effective at the Harvard School of Public Health. You’re going to love the Wein Mini-Mate Wearable Air Purifier if you hate the idea of breathing germ-ridden air in confined spaces like airplanes or other germ zone. This little wonder hangs around your neck like a magic pendant, fending off allergens, germs and everything else you don’t want to breathe. They all get sucked into the air purifier and cleansed away before pure air is emitted back out for breathing. 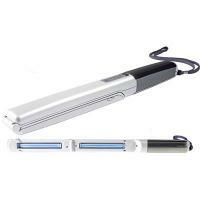 Handheld UV Saniizers are wands that eliminated 99.9% of viruses that cause cold and flu. They also kill bed bugs, dust mites, E.Coli, MRS and flu bugs, all with a wave of your hand. The CleanWave UV-C Sanitizing Wand is a great place for a germophobe to start. There is no such thing as an environment that is too clean when you are sensitive to harmful allergens, environmental toxins, virus and bacteria. It even kills bed bugs. Hospitals use wands like these to clean bedding and counter surfaces. You can too. Wandering germophobes will want to check out the Zadro Nano-UV Disinfection Light Scanner. This compact, cell-phone sized germ killer can go anywhere you go and kills or eliminates 99.9% of the nasties on hotel remotes, door handles, public railings, shopping cart handles. You can even disinfect your own kid because the light is perfectly safe if not shown in the eyes. Let’s say you don’t like dirt or germs around your home or office, and you’d like to eliminate 99.9% of dust mites, bed bugs, viruses, bacteria and allergens while you vacuum. 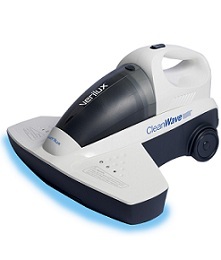 It’s possible with the CleanWave UV-C Vacuum Cleaner. In countries like Japan where overcrowding is common in big cities, the citizens have no problem donning masks to prevent the spread of disease. That’s not being germophobic, it’s being smart. And people with allergies literally have to figure the air is full of particles as “germs” that can make them sick. Same goes for asthma sufferers. That’s why allergy masks are a good idea for both germ and allergyphobes. When it comes time to clean the house and you don’t want germs, dirt, mold, mildew or other allergens hanging around the house, allergy cleaners for household use are ideal to cover the gamut of concerns for germophobes and allergyphobes alike. Cleaning products that help you rid your house of these problems are ideal to give you peace of mind, right down to the Ultimate One-Wipe Dust Cloths that help prevent dusting from triggering allergy symptoms. So you see, being a germophobe can be a practical pursuit if you know where to look for products to help you clean and prevent contamination by germs that are everywhere you look, even in the invisible places. But don't blame us for planting seeds of terror over germs in your mind. We just told you how to get rid of them. The rest is up to you.